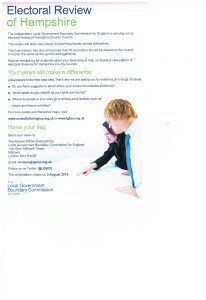 Ellisfield Parish Council has been asked to publicise this Mid Examination Local Plan Re-Consultation. In that Basingstoke & Deane Borough Council (BDBC) have proposed significant modifications to its original submission of their proposed Local Plan (2011-2029). After initial submission for examination in October 2014, the Inspector, confirming that all prior submissions had been considered, required BDBC to enhance their plans. Thus Main Modifications to this Submission, some of which the Full Council (BDBC) have upheld, have been scrutinised and are now for public review prior to further approval/amendment or whatever. The deadline for this mid examination and re-consultation is 4pm on Monday, 22 June 2015.
an increased annual housing requirement for 2011-2029 from 748 to 850 per year; effectively doubling building total to 15,300 dwellings with an additional 7,600 homes. the allocation of an additional housing site of 750 dwellings at Hounsome Fields; southwest of Basingstoke along the Winchester Road, and involving Gypsy, Traveller and Travelling Show People accommodation sites. the inclusion of a job target of 450-700 jobs per year across various sectors including; -specialist/advanced manufacturing (with R&D); – enhanced offices for financial & business services in Basingstoke town (many offices still considered poor quality); – plus distribution and logistics business enhancement with extra warehousing facilities. all economic growth being supported by enhanced fibre optic broadband and mobile telecommunications and increased social infrastructure in education and training to obtain the necessary skills, knowledge and competencies. Unemployment being only 2.4% in Basingstoke and recruitment often seeking migration to fulfil, as recently publicised. loss of leisure facilities at Basingstoke Municipal Golf Course, for example. all extra building being proposed on 12 greenfield sites, although two additional brownfield sites added previously seemingly of lesser significance within this enhanced plan. Although Ellisfield is not marked on the BDBC map, it is being fully consulted. Without doubt, it can be concluded that this enhanced Local Plan brings urbanisation closer to the rural villages around Basingstoke, which may or may not be to residents desires. Certainly nearby roads such as A339 and Cliddesden to Preston Candover Road, via Axford, will possibly/likely be affected with potentially 10,000 or more local vehicles. To say nothing of other commercial centres having an outlying affect. However economic growth does bring many advantages too. For your assistance; research can be found at http://southwestactiongroup.wix.com/swag from its extensive activities, recent public response and meeting. its apparent assumption that building will include Affordable Housing as mixed housing developments but that parish needs will likely flow from this Local Plan in Neighbourhood Plans, once, or if, it is fully approved. These documents are available for public inspection at Basingstoke and Deane Borough Council Offices between hours 8.30am to 5.00pm on Mondays to Thursdays, and 6.30am to 4.30pm on Fridays, and at all public libraries. for further information and advice please contact Planning Policy Team – 01256 845450. With much regret, the swings on Lower Common are still out of use today, 1st July 2015! Unfortunately the four new bearings required, though now enroute from Finland, are essential for attaching the chains and seats for the two swings. Hopefully these parts will be delivered direct to Ellisfield in about 2 weeks from now. Naturally Ellisfield Parish Clerk has chased their arrival as possible but no-one keeps these parts in stock in UK, apparently. Am sure that with the kind services of Tony Matthews and Cllr David Richards, these two engineers will mastermind the repairs and get the swings up and swinging as soon as possible. This entry was posted in News and tagged Health & Safety Play Equipment Lower Common on 8th June 2015 by Clerk. The independent Local Government Boundary Commission for England is reviewing the Hampshire County Councillors (currently 78 and likely to stay the same number) electoral divisions. They want evidence to help decide on a possible new pattern of divisions in future. Your views will make a difference and they ask for you to have your say.